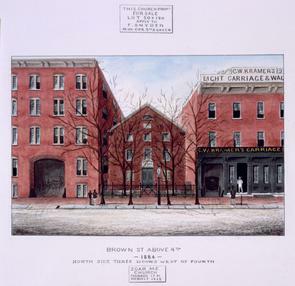 Brown St above 4th St.
African Zoar was founded by 18 free black men and women who defected from St. George's United Methodist Church in 1794. When the white congregants of St. George's tried to force black members into segregated galleries during service, the blacks walked out. 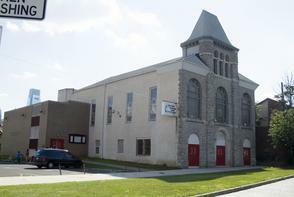 This split led to the founding of two new churches in Philadelphia: Mother Bethel AME in South Philadelphia and African Zoar in Northern Liberties. 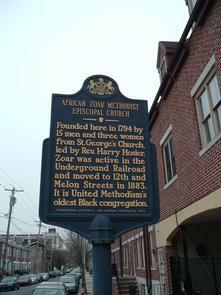 Although African Zoar's earliest incarnation had both and black and white membership, it is the oldest black congregation in United Methodism in continual existence, and Zoar and St. George's are the two oldest United Methodist churches in the city. Mother African Zoar United Methodist Church, as it is now known, moved a few blocks west to 12th and Melon Streets in 1883 and continues to minister to the spiritual and social needs of African Americans. Although the founders of Zoar (meaning "good will" in Hebrew) broke with the white Methodists of St. George's, they chose to remain in Methodism because of its history of early opposition to slavery, its evangelical style, and its tradition of ministering to the social needs of the community. The location of Zoar in Northern Liberties reflects the expansion of Philadelphia's free black population. By the mid-1800s, the Cedar Street Corridor (anchored by Mother Bethel) in South Philadelphia retained its historical primacy as the center of free black culture, but it was no longer the only place in Philadelphia for African American life and activism. Antebellum Northern Liberties fast became a northern Philadelphia hub of the free black community. Forty-eight black families clustered in the area between 4th and 5th Streets alone. This neighborhood was known as Paschall's Alley and became an integral stop on Philadelphia's intricate Underground Railroad in the 1830s and 1840s. Residents of Paschall's Alley included barbers, bakers, chimney sweeps, and undertakers, many of whom doubled as railroad agents, hiding runaways in their homes. Methodist churches in Philadelphia had roots in the abolition movement and played key roles in organizing the Underground and providing material aid and shelter to fugitives. In the 1830s, Zoar served as both a shelter and a meeting space for the Vigilant Committee, an abolitionist and fugitive aid group founded by some of Philadelphia's most prominent black leaders: Robert Purvis, William Still and James Forten. Nash, Gary B. Forging Freedom: The Formation of Philadelphia's Black Community, 1720-1840. Cambridge, MA: Harvard University Press, 1998. Switala, William J. Underground Railroad in Pennsylvania. Mechanicsburg, PA: Stackpole Books, 2001.